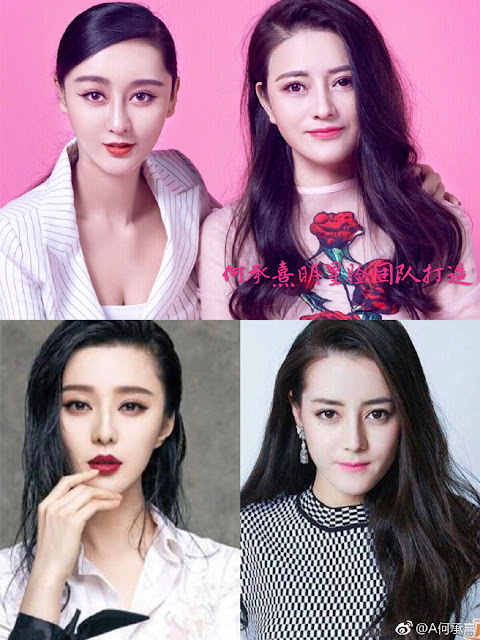 Still on the subject of plastic surgery, I'd like to introduce you to replica Fan Bingbing and Dilraba Dilmurat. What d'you think guys? In the era of idols and movie stars, there are no doubt fans who are prepared to take their admiration of beauty to the next level. He Chengxi, also known as "Replica Fan Bingbingbing", spent a WHOPPING 8 million yuan in 8 years to turn herself into her idol. With positive reviews on the result, well, she doesn't just stop there. This time, she and her team of cosmetic experts (yup she owns a cosmetic surgery business if you want to look like your favourite celebrity) set her sights on the ambitious transformation of her friend, A Jing, to resemble actress Dilraba Dilmurat. Her friend, a 42 year old woman underwent the changes in 15 days. I'm no expert in plastic surgery but how is it even possible to have everything done and healed in 15 days?! Assuming here that the transformation requires multiple surgeries since it took He Chengxi herself 8 years to turn into replica Bingbing. If you've ever watched the Korean show Let Me In where plastic surgery experts make life changing transformations, you'll know that it takes quite a few months to complete the transformation and also for the face to heal. Anyways, He Chengxi seems quite happy with the changes to herself and to her friend, claiming that cosmetic transformations have the ability to change lives and destinies. 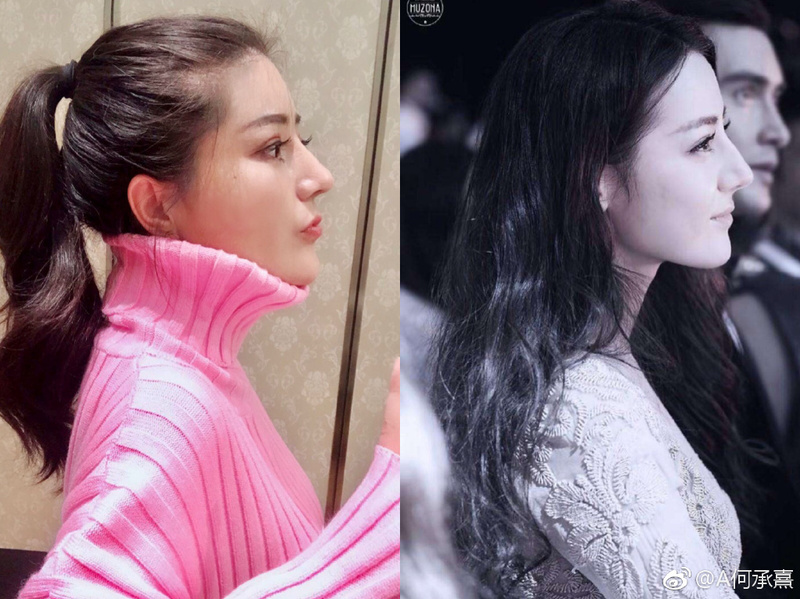 In her case, whenever body and face doubles of Fan Bingbing or Dilraba Dilmurat are needed, looks like these two will be high up on the roster to call. This obsession to look like a celeb or a dol is MENTAL ILLNESS. And beautiful is not the word to describe these people. Fake replica plastic monster is the more appropriate term. And all the surgeons who participated in this should be ashamed to call themselves doctors. Makes sense. FBB isn’t that good at acting but she has businesses everywhere. At this point, she should quit cosplaying as an actress and just be a business madame. I'm not a fan of FBB acting and not a fan of FBB face but I cannot agree she isn't good at acting. If you think she isn't good, look at today, nobody is even as good as even by just 1/3. FBB worked her way up with so many small roles like a maid HZGG, being a spoiled princess in Lion Roar who is a man stealer, an evil role in Twins Effect, small role in XLFD, etc. All those roles are small and actually even "bad" roles but she slayed them into pretty nice and memorable ones. She did really well in them. She did not need to prove herself by being the main girl only. Whether she play good or bad roles she did well. Today her acting isn't great and falls into the same level as everyone else because there are no more good scripts and directors. That might be the reason why new actresses today just can't be as good as past actresses. Today, somebody can be a maid or a main girl, and they are not good at all no matter what role they play. I can't read Chinese, so I don't know for sure, but I think what they meant by 15 days is that they did the procedures over the course of 15 days, not that she had the surgery and healed in 15 days. If that's not what they meant, I think they're lying, at least when it comes to nose surgery, because having recently broken my nose and possibly needing surgery, I was told by several doctor that you need at least one to two weeks for visible swelling to go down and around 6 months to a year for complete swelling to disappear. This lady looks like her nose is no longer swollen at all. This is so crazy, though. This level of fandom is insane! I don't think they actually look like their idols so much as resemble them, but in a creepy way. I can't quite put my finger on what's quite off with their faces--probably the fact that they don't look "natural," like if I saw them on the streets, I'd probably recognize that they've had surgery done. But hey, whatever makes people happy. I'm not against plastic surgery, so if this makes them happier, then more power to them. Whoever they marry needs to remember the genes she carries. Her new face will not be passed on to their kids. 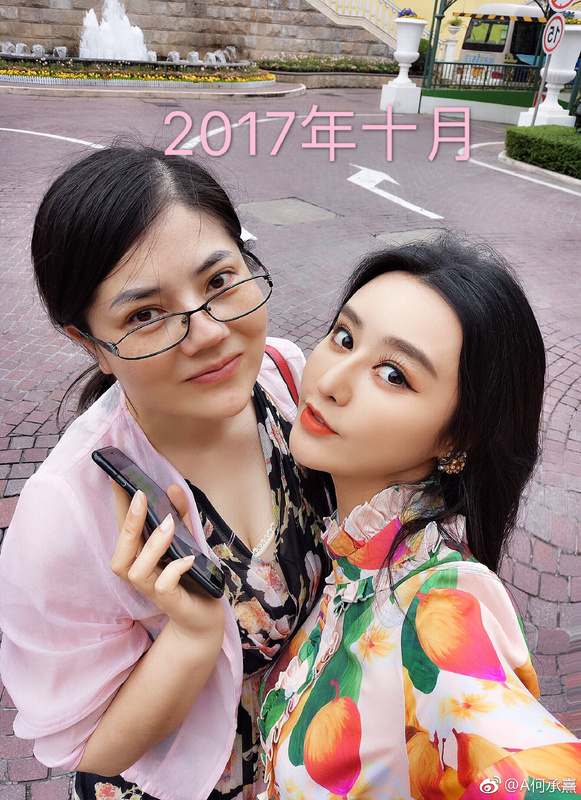 I see the resemblance with the Fan BingBing girl, but I wouldn't mistake her for the real person. The other girl doesn't look like Reba at all (for both the front photo and the side angle). Obviously she looks a bit more like Reba compared to what she was born with, but still don't see the resemblance (there's something weird with her eyes in the front facing photo). Though it's their own personal choice to do these procedures to look like their idol, I think they're not getting the point. I think for reba you can't pull it off unless you mixed cause Reba has western features. Also is FBB really a 'natural beauty' ? cause she doesn't look it to me IMO that nose does not look natural. Is FBB a natural beauty? Well she started her career at age 18 in Princess Pearl. You can just tell by looking, she is completely natural in there. To be honest, all actresses and actors were all natural in there, all of them. They didn't use extreme make up and over use of filter effect in those old dramas. Today, all those actors aged. So they probably done botox to hide the aging, but when they were young they were all once famous and natural at the same time. But that's still a better thing than today. Who can get famous these days if they don't do PS? They can be famous, but must be plastic. Or...maybe they can be famous for looking ugly (but natural). don't yall people think since the actors today are the people who did PS in the first place, if what they're doing isn't wrong, then it shouldn't be wrong that the public are following suit?